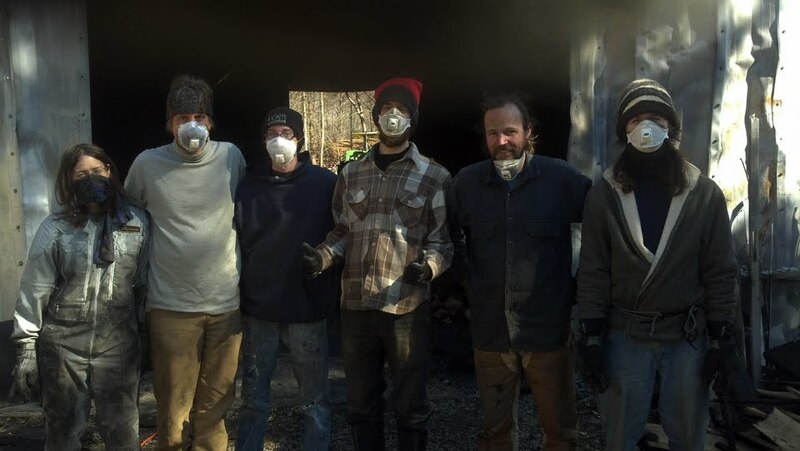 A crew from Twin Oaks came over to help with the cleaning up of Acorns steel building which burned a couple weeks back. i ran around with a dust mask on mostly shoveling and moving wheelbarrows full of charred often indistinguishable items to the large rented dumpsters. We dutifully separated out copper and other valuable parts, which one day might be usable. But it was not until today that i really realized the magnitude of the loss. A newly purchased vehicle was destroyed (despite Daniels heroic efforts to move it from the steel building inferno). A $2K table saw is now junk. Tens of thousands of dollars in seed inventory was destroyed (though curiously, some thousands of dollars of seeds which where were being stored in a deep freezer that was completely engulfed in flames may have survived – as did some ice cream). 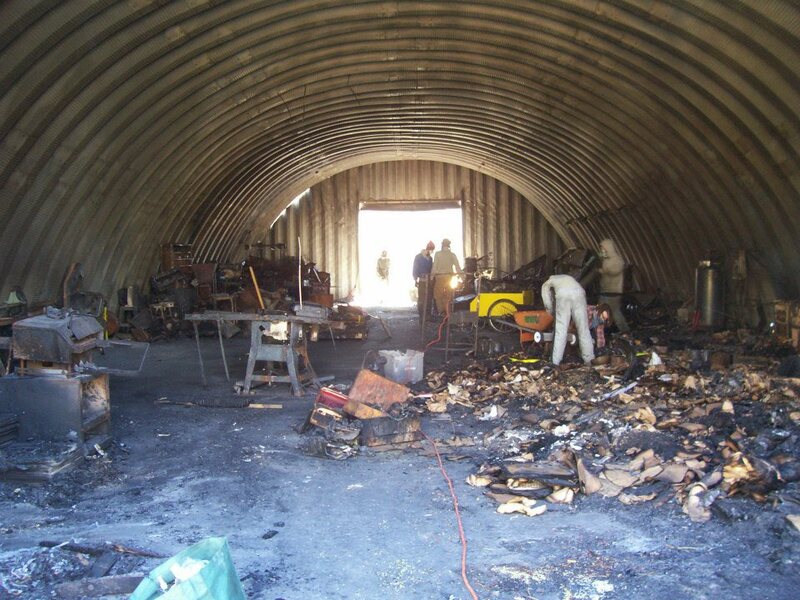 And it leaves Acorn with the vexing problem of what to do with the hull of the torched Quonset hut. The structural engineer we employed to review it says that the building is probably structurally sound, but the galvanization which coated the steel has been burned off and if we want to use the building we should 1) paint it to prevent rusting and 2) store things in it which it is okay if the building collapses on it. Sadly we do not have enough stuff which can have buildings collapse on them and as an operating farm and agricultural business, we have significant storage needs. We are faced with an odd problem: we are not poor–the businesses are pretty successful, so we are reluctant to ask for financial help from those who have offered it. And at the same time we can not afford to build a new building on this site (at leas this year), with the new seed building under construction and other business capital needs. And while this is certainly a high class problem, it is a problem none-the-less. I am sadly imagining the phoenix that will rise from those ashes. It’s so sad. I do hope people jump into help. I’m glad the crew from Twin Oaks came over to help. I got to briefly see the damage and it looked awful. Nevertheless, no one was hurt and I know that Twin Oaks and East Wind have had major fires and recovered. The folks I spoke with at Acorn seemed hopeful. I’ll echo what Richard said above–like the phoenix, may things rise again and even stronger.